For this recipe, you’ll need a silicone 10- or 12-egg Easter-egg mould about the size of an actual egg (they are available online). You will need to repeat the below steps until you have created 20 egg halves, or you can use two egg moulds. Fill the egg mould with the melted chocolate and give it a slight jiggle to get rid of any air bubbles. Turn it upside-down over a baking tray and allow the excess chocolate to drip out. Scrape any excess chocolate from the surface of the mould to ensure the egg halves have nice, clean edges. 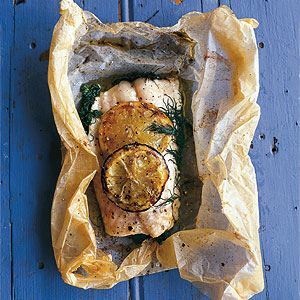 Leave to set in the fridge. You can use the leftover chocolate to make more eggs, or store it in a ziplock bag at room temperature and use it in other recipes. Once the chocolate egg halves have set, fill them about halfway with softened ganache. Place a Ferrero Rocher chocolate in one-half of the egg halves and leave them to set at room temperature for 1 hour. Carefully remove the filled egg halves from the mould and use a toothpick to smear some melted chocolate around the edges of half of them. Stick two halves together, to create full eggs. Use your finger to wipe away any excess melted chocolate. Don’t worry too much about finger marks, because you’ll be painting over them. Refrigerate for 1 hour to set. Preheat a fan-forced oven to 140°C or a conventional oven to 160°C. Line a cupcake tin with the cupcake cases. Add the flour, sugar, cocoa powder, bicarbonate of soda and salt to a large mixing bowl. Mix on low speed with a hand mixer until combined. Next, add the softened butter and continue mixing on low speed until the mixture reaches a crumbly, sand-like texture. Add the eggs and milk and mix again on low speed until all the dry ingredients are incorporated. Scrape down the side of the bowl and mix for a final 20 seconds. Once the cupcake batter is ready, fold in the speckled eggs. Fill each case three-quarters of the way. Using an ice-cream scoop to transfer the batter to the cupcake cases makes this a quick and easy process and ensures each case contains exactly the same amount of batter so that the cupcakes bake evenly. Bake for 40–50 minutes, or until a toothpick inserted in the centre of a cupcake comes out clean. Allow the cupcakes to cool completely on a wire rack before frosting. 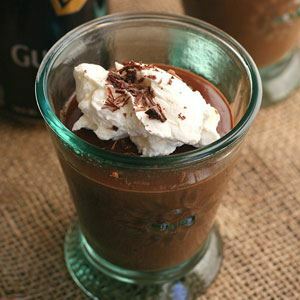 Combine the chocolate, butter and cream in a large, microwave-safe bowl. Microwave on high, for 20 seconds at a time, mixing between each interval until smooth. Once fully melted, cover with plastic wrap and leave to set. Alternatively, you can use the double boiler method. Fill a large saucepan one-third of the way with water and bring to the boil. Place the chocolate, butter and cream in a large glass or metal mixing bowl and set it over the pan, making sure the bottom of the bowl doesn’t touch the water. Gently stir the mixture until it is completely melted and smooth. Remove from the heat and leave to set at room temperature. 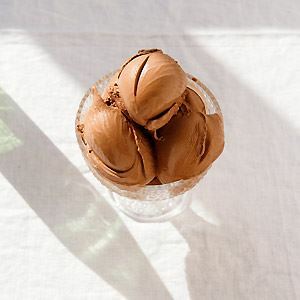 To soften the ganache to spreading or piping consistency, microwave on high for 10 seconds at a time, mixing well between each interval, until it becomes soft enough to spread easily but firm enough to hold its shape. If you soften it too much, don’t panic, just let it sit at room temperate again until it firms up enough to use. Fit the end of a piping bag with a round tip, fill with the ganache and pipe a bulb of ganache on top of each cupcake. Nestle a chocolate egg on top. 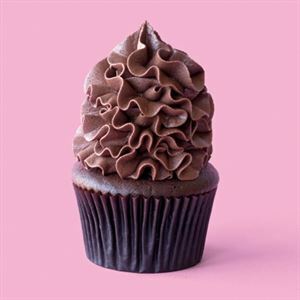 Make sure the widest part of the petal tip is facing down when you pipe around the cupcake. 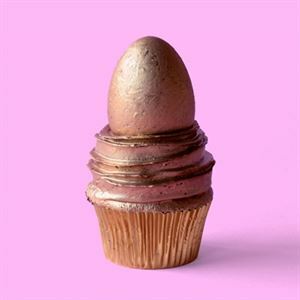 Start at the base of the cupcake and use the turntable to spin the cupcake as you pipe, making your way to just above the base of the egg. Repeat with the remaining cupcakes, then chill for 1 hour to allow the ganache to firm up before you paint it. To make the gold paint, mix the gold lustre dust and vodka together in a small bowl. Use a food-safe paintbrush to paint the ganache and the egg. You may need to use two coats of paint on the egg. Let the first coat dry before adding the second coat. 2 x silicone 10- or 12-egg Easter-egg mould about the size of an actual egg. 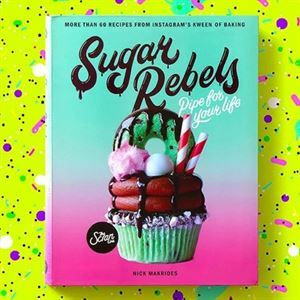 Credits: This is an edited extract from Sugar Rebels by Nick Makrides published by Hardie Grant Books and is available in stores nationally.